Portugal’s INCREDIBLE Success: Winning 3 wars in Africa against blacks with Whites were moving to Africa! The Portuguese had a brilliant leader who did NOT believe in democracy, communism or liberalism! His name is Salazar. A Portuguese friend of mine described him as a “Hitler”, a tough leader. But Salazar did incredible things for Portugal. He also ruled it as a dictator for 48 years. A few years after he died it all collapsed. I am a believer in the “Great Man Theory of History”, and this is just more proof of the importance of having a brilliant, powerful leader, and what he can do for a nation. Although Salazar liked Franco the Fascist of Spain (who was friendly to South Africa), Salazar was a Christian and did not like the paganism of Italian Fascism and German NAZISM. António de Oliveira Salazar; 28 April 1889 – 27 July 1970) was a Portuguese statesman who served as Prime Minister of Portugal from 1932 to 1968. He was responsible for the Estado Novo (“New State”), the corporatist authoritarian government that ruled Portugal until 1974. A trained economist, Salazar entered public life with the support of President Óscar Carmona after the Portuguese coup d’état of 28 May 1926, initially as finance minister and later as prime minister. Opposed to democracy, communism, socialism, anarchism and liberalism, the ideology of Portugal was conservative and nationalist in nature. Salazar distanced himself from fascist dictatorships, which he considered a pagan Caesarist political system that recognised neither legal nor moral limits. Salazar viewed German Nazism as espousing pagan elements that he considered repugnant. Salazar also promoted Catholicism, but argued that the role of the Church was social, not political, and negotiated the Concordat of 1940. One of the mottos of the Salazar regime was “Deus, Pátria e Familia” (meaning “God, Fatherland, and Family”). I’ve been doing research because someone here in SA has come up with an idea that we are going to try. While doing research and thinking, I’ve stumbled upon some rather astounding facts. Here in Africa the Portuguese had 2 enormous territories: Angola & Mozambique as well as a much smaller territory in West Africa. Of these territories, Angola was the biggest (1/4 the size of the USA), and its freaking wealthy. Angola is perfect for farming. Angola also has oil and other riches. Angola is now a crap hole. I have discovered, to my shock and amazement that if you study Portugal in the period of their African wars until they quit their empire, that in fact the Portuguese were winning – big time! We whites here believed that the Portuguese were failing in their wars, but its not true. 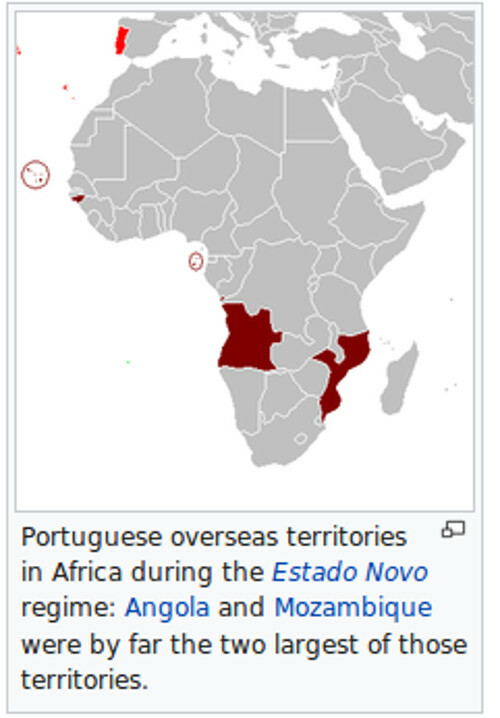 Portugal retained 3 countries in Africa as the Portuguese Empire. Portugal was calling up young men annually to go and fight in Africa. The wars were very unpopular, the “Vietnam” of Portugal you might think. 20,000 young men left Portugal annually to avoid military service. The wars were unpopular, and then there was the “Carnation Revolution” (which the CIA and KGB played a big role in). This revolution was bloodless, but the new Govt, led by a pro-Communist, immediately dissolved the Portuguese Empire. It gave independence to the blacks immediately. The result was a huge disaster for the Portuguese. Now the collapse of the Portuguese in Africa was an ENORMOUS DISASTER for the whites of Rhodesia. As a kid I remember Portuguese fleeing from Mozambique to Rhodesia with only their shirts on their backs. They abandoned their houses, etc. In speaking to Portuguese, I learned that when the black communists in Angola and Mozambique took over, that they froze the bank a/cs of the Portuguese people living in Angola and Mozambique. The Portuguese fled, leaving their houses and their money behind. As a kid I remember Portuguese kids in our schools and we got along with them. But for Rhodesia, the collapse of Mozambique was the worst disaster imaginable. It allowed the Chinese backed Zanu (Mugabe’s people), to move into Mozambique, and wage the most brutal part of the war against us there. But it turns out, that in doing some research now, that in fact, the Portuguese were doing fine in southern Africa. In Guinea-Bissau, the Portuguese were not doing well. They still controlled the major cities and towns. But the blacks controlled the countryside. However, for us in southern Africa Guinea-Bissau is of no importance. What is of importance to us were the wars in Angola and Mozambique. The Portuguese collapse later made problems for South Africa when Rhodesia had collapsed. To the whites of southern Africa, we had 5 white controlled countries at war: Angola, Mozambique, German South West Africa (Namibia), Rhodesia and South Africa. The loss of Angola and Mozambique was a big disaster for SWA, Rhodesia and South Africa. What I never knew was the state of the wars and what the Portuguese were doing. A closer examination, shows that, despite the pain the Portuguese were suffering in their wars, the Portuguese were winning. I did realise some time back from other analysis that the Portuguese DID have a winning strategy for Angola. In Mozambique, there were a total of 300,000 whites, slightly more than the 250,000 whites of Rhodesia. During the war in Mozambique, the Portuguese killed 10,000 black communist terrorists for the loss of 8,500 of their own people. The Portuguese did have black troops, so keep in mind that the 8,500 dead include the blacks in their forces. Interestingly, 50,000 black civilians were killed. Now this is an area that we will need to dig more into, because the question is who killed the black civilians. In Angola, I know the Portuguese took no nonsense and killed black civilians if the blacks supported the communist terrorists. This is a very important point that I want to return to in the future. The blacks commies also killed a lot of their own people, in Rhodesia and in South Africa too. So rest assured, some of the 50,000 dead blacks are also due to communist terrorist activity. Keep in mind that all black communist terrorists in southern Africa were armed by the Soviet Union and China with the latest weaponry. And they were trained by the Soviets, China and even the Europeans of the Warsaw Pact. The enemy, FRELIMO, had 20,000 guerillas. Facing them, the Portuguese built up an army of 50,000. In Mozambique the Portuguese had the enemy, FRELIMO, in the north of the country. But their control of Frelimo was not firm. Rhodesia also sent troops into Mozambique as was needed to kill enemies there. The Portuguese and Rhodesians co-operated well together. In Angola which was bigger, and where the blacks were much more powerful, the Portuguese did amazingly well. In Angola the Portuguese faced a black army of 90,000. The Portuguese had an army of 65,000. In Angola, they killed about 10,000 for the mere loss of 2,500 KIA and 3,400 non-combat related deaths. But the number of black civilians killed was in the region of 30-50,000. As per Mozambique … the Portuguese may have killed some of the blacks who supported the guerillas. This may seem like a brutal policy to you, but its one I TOTALLY SUPPORT. Its something that whites NEVER DID in Rhodesia nor South Africa. Its a critical point I want to return to another day. I think the Portuguese did the right things. Even wikipedia shows us some interesting things that I was aware of. Herein lies some of the genius of the Portuguese strategy in Angola. The Portuguese had worked out a strategy, which they later modified, which was a war winning strategy unlike what any whites in Africa had. Neither Rhodesia nor South Africa had a similar strategy. But Portugal, despite its colonies being enormous and difficult to defend, and despite Portugal being the poorest nation in Europe, was well on its way to VICTORY! It would have done what the British could not do, and what none of us in the end were able to do. Here’s how the Portuguese were going to do it. Their first strategy was to encourage whites to move into Angola and to settle in it! Yes, in the 1960s, the Portuguese began aggressively getting more whites to move into Angola! I read somewhere else, that the population of whites in Angola at its peak was 600,000 – more than double that of Rhodesia! Wikipedia does not say this. But even so, wikipedia shows that this is correct because it acknowledges the RISE in the population of whites from 185,000 to 450,000! That growth was in a period of approximately 10 years! For the record, whites ruled Angola for 470 years! That’s longer than America has existed! Whites were there since about 1500, about 150 years before whites settled in the Cape! Look at this chart of normal and exceptional Portuguese expenditures. I think the exceptional expenditures in 1974 might have been due to them having to withdraw their entire armies suddenly. So look at the expenditure up to 1973. 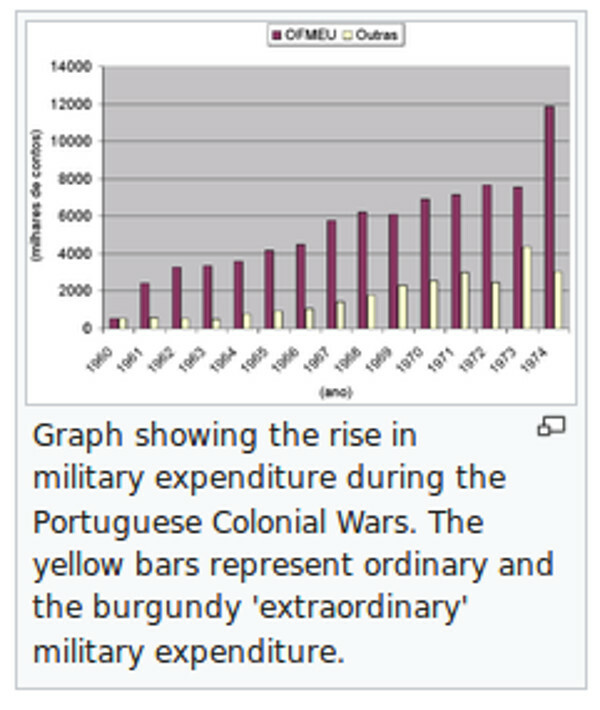 NB: The Portuguese were spending up to a shocking 40% of their annual budget on their wars in Africa! But we’ll discuss the plus side of this! Now look at this interesting set of statistics of Portugal’s GDP, from 1960, when the wars in Africa began until 1974 when it suddenly surrendered and stopped the wars. Also look at the GDP growth AFTER the “Fascists” were kicked out of power in 1974. Notice for example the incredible Portuguese GDP growth in 1973 of 11.2% and other very high growth of 9%, etc – all during a time that it was waging an intense war in Africa!! I highlighted certain years. But just look at how Portugal’s GDP was flying upwards under “Fascist” rule and WAR … but look at how pathetic and even NEGATIVE it was AFTER “Peace” and the “bad Fascists” were out!!! One of the arguments given for European countries abandoning Africa was that most Colonies were costing the Europeans & British more than they were worth. For all her rationalizing mythology, Portugal’s motives in retaining control of her overseas territories have been essentially economic and financial. Metropolitan Portugal’s balance of payments has in the past been heavily dependent on the foreign exchange earnings of the African ‘provinces’. Mozambique and more particularly Angola, besides being traditional sources of raw materials are also endowed with vast and unexploited natural resources. When the other European imperial powers withdrew from Africa, Portugal did not follow but tenaciously clung to her colonies, causing three colonial wars (Angola in 1961, Guinea (Bissau) in 1963, and Mozambique in 1964) which for over a decade have been a relentless drain on Portugal’s limited financial resources – almost half the annual budget is committed to maintaining the Portuguese presence in Africa. Portugal, one of Europe’s least developed countries and heavily reliant on exclusive access to its colonial market and raw materials was not in a position to follow the example of France and Britain who, with their wider interests, had much less reason to fear foreign competition and were therefore able to exercise indirect economic and political influence in their erstwhile colonies. The Portuguese economy on its own was not strong enough to develop the extensive resources of Angola and Mozambique and at the same time to finance three costly counter-insurgency campaigns. Firstly, in April 1965 Portugal abandoned her traditional policy of restricting foreign investment in her colonies, and foreign investment has since been actively encouraged. American, South African and West German capital has flowed in to develop resources which Portugal could not herself fully exploit. This decision was not taken without misgivings since it would inevitably result in some diminution of Portugal’s previously exclusive control. Secondly, Portugal has recently granted a significant, degree of constitutional autonomy to territorial legislatures in Angola (53 seats), Mozambique (50 seats) and Guinea (Bissau) (17 seats), which are now being referred to as ‘autonomous states’. The cost of the wars in Africa was tremendous by Rhodesian standards, but it was WORKING for Portugal. Portugal’s economy was at times growing fast enough to catch up to the rest of Europe which it had lagged behind for decades. Besides that, the overseas territories were also displaying impressive economic growth and development rates from the 1920s onwards. Even during the Portuguese Colonial War (1961–1974), a counterinsurgency war against independentist guerrilla and terrorism, the overseas territories of Angola and Mozambique (Portuguese Overseas Provinces at the time) had continuous economic growth rates and several sectors of its local economies were booming. They were internationally notable centres of production of oil, coffee, cotton, cashew, coconut, timber, minerals (like diamonds), metals (like iron and aluminium), banana, citrus, tea, sisal, beer (Cuca and Laurentina were successful beer brands produced locally), cement, fish and other sea products, beef and textiles. Tourism was also a fast-developing activity in Portuguese Africa both by the growing development of and demand for beach resorts and wildlife reserves. Look above at the incredible output of the Portuguese in Angola and Mozambique. In terms of tourism, most Rhodesians who wanted to go to the beach, went to Beira in Mozambique rather than South Africa. The Portuguese economy had changed significantly prior to the 1974 revolution, in comparison with its position in 1961—total output (GDP at factor cost) had grown by 120 percent in real terms. The pre-revolutionary period was characterized by robust annual growth rates for GDP (6.9 percent), industrial production (9 percent), private consumption (6.5 percent), and gross fixed capital formation (7.8 percent). The post revolution period was, however, characterized by chaos and negative economic growth, as industries became nationalized and the effects of the decoupling of Portugal from its former overseas territories, especially Angola and Mozambique, were felt. So despite all the talk of the "unpopular colonial wars”, and the Portuguese spending up to a staggering 40% of their budget on the wars in Africa, the Portuguese were actually rocking and rolling and driving the black communists back! They were encouraging their whites to emigrate to the colonies, especially Angola, and the white population was going up and the economy was booming. Mozambique and Angola were benefiting Portugal economically. This was all happening under Salazar’s rule and the Portuguese have never matched their awesome achievements since. If the stupid CIA/KGB Carnation revolution have never happened, the Portuguese would have grown ever stronger, especially in Angola! In Angola they were so successful that they drove the black commies into a corner of the territory and had them under control. As you can see, the white population of Angola at one time must have reached at least 600,000! The economy was booming and everything was moving forward. It was only the stupid Carnation revolution that robbed the Portuguese of total victory and future growth in Angola. For Rhodesia, Mozambique was a massive buffer state that helped us tremendously, and with our co-operation with the Portuguese there, between us, we could probably have controlled the blacks there too indefinitely, with no real threat to Rhodesia. The Portuguese were unquestionably the front line of the war between the whites of southern Africa and the black communists. If the stupid Carnation revolution had never happened… there might still be 5 white ruled countries in southern Africa! As for the Portuguese, goodness only knows what Angola would have become! Today Angola and Mozambique are crap holes, and they slowly try to pull themselves out of their destruction, which they rightly deserve. The Portuguese were the ONLY whites in Europe absolutely determined, at a leadership level, to remain in Africa. Look at how well they did, compared to the pathetic spineless British, who ran out of Africa like the worthless dogs that they were! Compare instead, how Portugal supported its whites in Africa and threw everything it had behind them – and it was a the poorest country in Europe! Look at what they achieved and how they could GROW ECONOMICALLY, while building a country AND waging several wars at once! Imagine if, the dogshit worthless British had showed even a tiny amount of the spirit of the Portuguese, what could have transpired in Africa! In Kenya for example, there were 60,000 very successful white British farmers. Imagine if the British had encouraged and supported whites to move into Rhodesia and Kenya and had supported them, what might have transpired! What is illustrated very clearly here, is the incredible power of whites, and that whites can drive blacks back militarily, while colonising a country and building it at the same time. What you are seeing here is a rerun of the Roman Empire. The same methods that worked in the past, will still work today. It would work even now, if the West changed its attitude. What is completely ignored by the modern "intellectuals”, liars and scum, is the importance of PHYSICAL COLONISATION. Having Whites on the ground, in Africa building, working and fighting; works every bit as well as it did for the whites who took over North America, and it works as well as when the Roman Empire was on the march. The same principles will work now, as well as in the future! Furthermore, it should be abundantly clear, that the blacks, if left to themselves, return to a type of chaos that is a reflection of themselves. But if you want white European civilisation, you can only get it by putting white people there, who have a "Blood and Soil” ethic. It doesn’t even matter if the blacks outnumber them, and if the blacks receive military aid from communist super-powers … the whites can smash them back and drive them back! Africa CAN be recolonised, any time in the future when whites wish to do it again! We can do in Africa, what whites did in North America; and we should do it. The end result would be marvellous. We don’t need the blacks in Africa. All we need are WHITES IN AFRICA. We don’t need the blacks around. Imagine if ALL of Africa was totally white! It would be richer than North America and Europe combined. It would be the most incredible place. With respect, you still talk about ‘communists’ were you mean Jew controlled groups. The ‘carnation’ revolution sounds like a Soros-style thing. The weapon funding presumably was by Jews, as usual. You STILL don’t factor in the Jew issues! Another point struck me re Salazar. Portugal is I think unique in discussions of whites: it (or Jews there) has a race-mixing policy, after which it was regarded as mulatto and finished. Salazar of course was 20th century; so what happened? Was it something to do with Jew policies? Spot the missing element in the description.